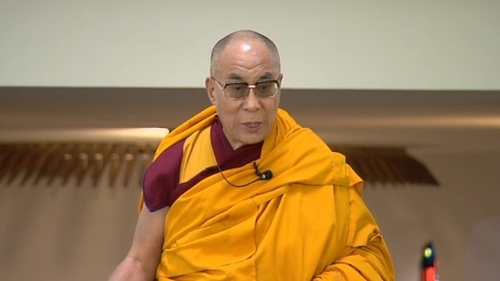 The Dalai Lama has completed his two-day visit to Ireland with an address on 'The Power of Forgiveness' at the University of Limerick's sports arena. Over 3,000 people listened to the Dalai Lama's address, which lasted for over an-hour-and-a-half. He spoke in particular about the power of compassion, love, forgiveness and tolerance, and said these are the cornerstones across all religions. He said he had made religious harmony his lifelong commitment, as well as promoting the human values of compassion and forgiveness. The Dalai Lama had a particular message for young people and the education system. He urged parents and teachers to train young people in compassion. He said they could learn the value of compassion through attitude and actions and a genuine smile. The audience gave him a standing ovation when he urged them never to give up hope. The visit also included a number of musical performances by the Irish World Academy from the University of Limerick, the Monks of Glenstal Abbey and the Irish Chamber Orchestra. A group of 30 young children from regeneration schools in Limerick composed a special song about forgiveness for the Dalai Lama's visit. The Dalai Lama was accompanied by Richard Moore, who established the Children in Crossfire organisation, which works on behalf of children caught up in poverty and injustice. The Derry man was blinded when he was struck by a rubber bullet when he was ten. He went on to meet and befriend the man who fired the bullet, Charles Inness, who also attended today's ceremony. The Dalai Lama is a patron of the Children in Crossfire organisation. Hundreds of people from community and business groups and from the world of sport, as well as those touched by deep human tragedy and suffering, attended today’s event. 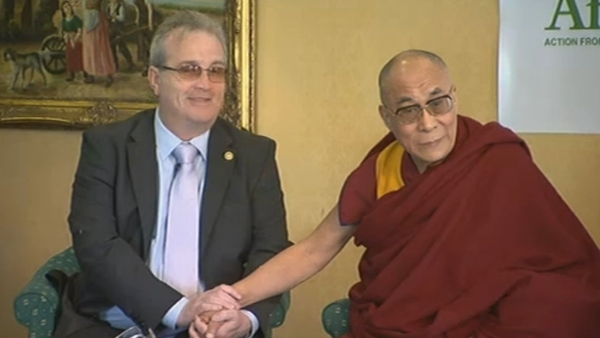 Among them was Tyrone football manager Mickey Harte who later spoke of the very simple message that the Dalai Lama brought and said he felt privileged to be there. Many others spoke of how they were moved by the Dalai Lama’s message and how to see him live was a once-in-a-lifetime opportunity.